Camp is closed on July 4th; some weeks include optional overnights which are included; field trip to Six Flags is an additional $20 fee payable to Gan Izzy. Located on 5.5 beautiful acres! Great counselors and small groups means lots of camper attention! Camp runs weekdays from June 24th- August 2nd from 9:00 a.m.- 3:30 p.m.
Raise your hand if you're tired of the hours and hours of Fortnite and re-runs of Spongebob Squarepants? OK, by the show of hands, we can see you're ready for today's exclusive Conejo Deal! 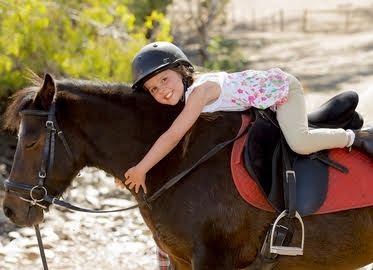 At Gan Izzy Ranch Camp, your kids can enjoy fun and exciting activities like horseback riding, swimming, sports and more while YOU can enjoy the beauty of a quiet house and the knowledge that your kids are having an incredible camp experience on a beautiful five-acre ranch in Moorpark! For just $99, your child can enjoy 3 full days of camp, or for just $149, go all week! Camp weeks are as follows: June 24-28, July 1-5 (closed on July 4th), July 8-12 , July 15-19, July 22-26, and July 29- Aug 2. To see each week’s specific activities, check out the calendar at Giranchcamp.com. What we love about Gan Izzy Ranch Camp is that it is run by Devorah Heidingsfeld, mother of 7, who also runs the Chabad Jewish Center of Moorpark and Outreach program. While everyone is welcome, Gan Izzy was designed to be a classic camp experience built around Jewish values and traditions.